Steelwood Lake is known as the finest private lake in Alabama. In the 1950s, U.S. Steel brought corporate guests and friends to the Fish Camp to hunt and fish. When the property was purchased in the early 90s, the lake was not in the best of shape. The first major task was to drain the entire lake and get rid of the cumbersome grasses that were preventing the fish from thriving. Restored to magical proportions, Steelwood is recognized as one of the best managed lakes in the state today. The beautiful 200-acre lake is fully stocked with bass and bream and is a favorite area for family retreats. Enjoy the opportunity to sip a beverage in the rocking chairs on the dock and watch your kids reel in one fish after another. Arrange a fish fry of your fresh catch or a huge bonfire after a long walk on the nature trails. The accommodating staff caters to your every need and is always available via radio, or cell phone. Other than our pontoon and workboat, no gas-motor boats are permitted to disturb the quiet and tranquility of this pristine lake. We even have a canoe available for guests who would like to paddle on the lake. Our boats are always ready when you arrive, stocked with all the fishing gear you’ll need, as well as your favorite beverages. To make your fishing reservations please call the Pro Shop at 251.964.7165. The Fish Camp is open daylight to dark Wednesday through Monday. 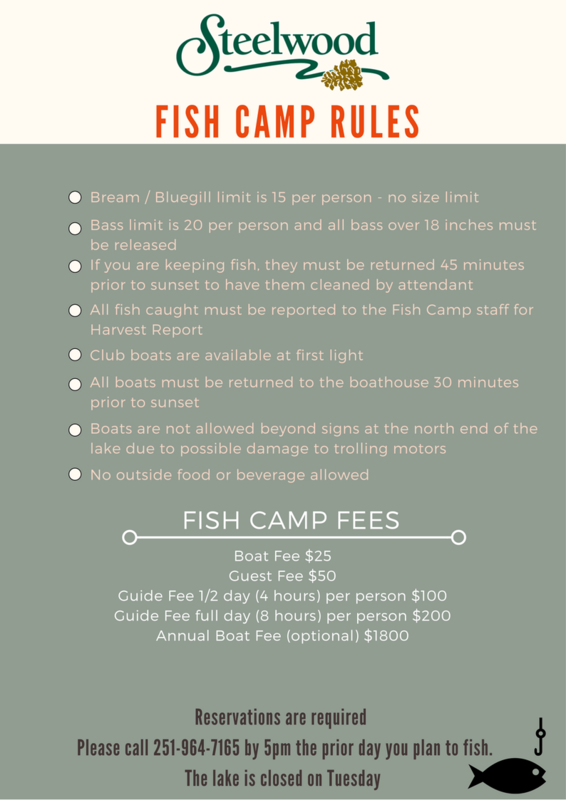 For an up-to-date fishing report, call Teddy Everett, Fish Camp Manager at 251.964.7165. All members may fish the Lake for a daily fee of $25 per person. Guest fees are $50 per person. 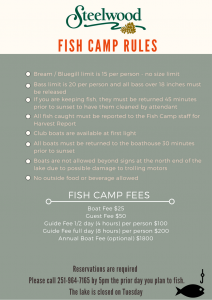 Fishing equipment is available at a nominal charge.